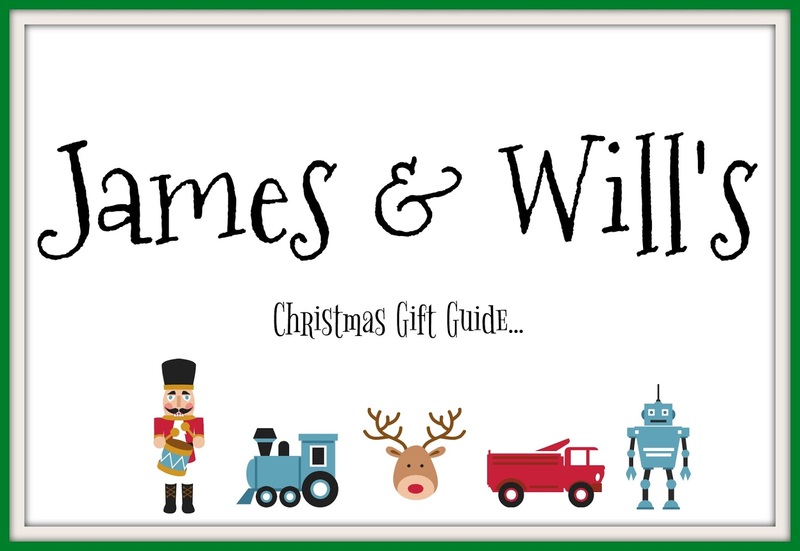 I'm joining you today to share my boys' Christmas gift guide. This list is an assortment of things we actually own AND things that are on their wish list this year. 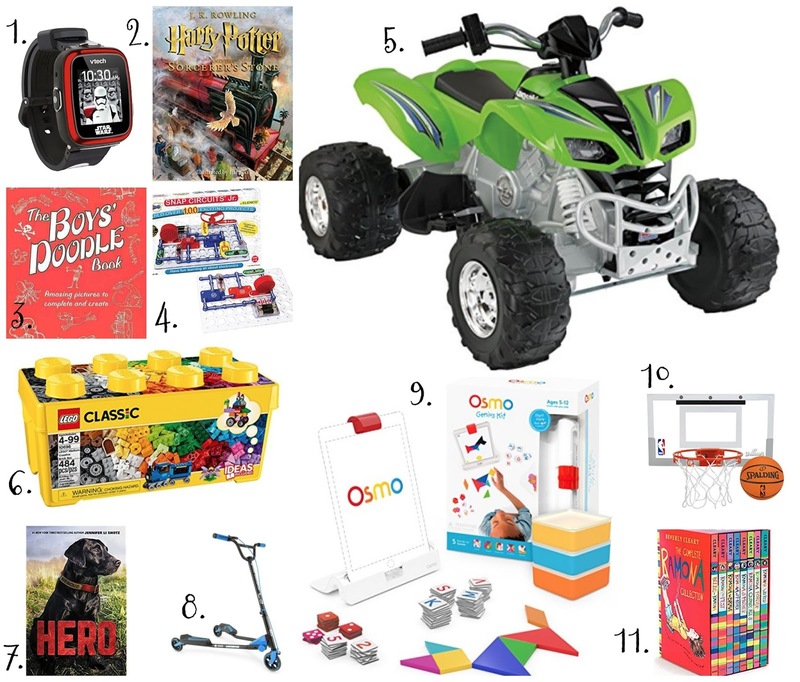 If you have a little boy you're shopping for, these are our tried-and-true (for the most part!) items. There's plenty more I could've added to the list, but this is a great start. If you need more suggestions OR if you have things you would've added, comment below! Just as a reference, Will is a 5.5 year old kindergartener and James is an 8 year old 2nd grader. 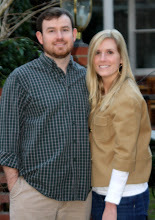 Will is VERY engineering-minded, outdoorsy, and busy. James is very creative and very, very bright. 1. VTech Star Wars First Order Stormtrooper Smartwatch. Neither of my kids have this watch, but they're both asking Santa for it! They both asked for a smart watch and I didn't want one with a phone on it. This one has video, a camera, games, and is a fitness tracker. This version is currently sold out, but I saw it on Amazon for as low as $31 this week! Keep watching! 2. Illustrated Harry Potter series. James and Will LOVE these and so do I. These are the original Harry Potter books that are BEAUTIFULLY illustrated. I love these so much that I'm about 99% sure I recommended them last year. Currently, there are 3 out (James gets one for his birthday each year because they come out in the fall). Each is just gorgeous. 4. Snap Circuits. Both boys love these, but James has spent more time playing. This is a child-friendly circuit board that you have to correctly connect for it to light up, play music, etc. There's a book of instructions but you can also make up your own circuits. 5. Power Wheels 4-Wheeler. James got this for Christmas from Santa about three years ago and he and Will have driven it for countless hours. The worst thing we did was NOT buy a second one. It's a little bit of a battle. James is between 50-60 pounds and he can still ride it. Ours is blue so we don't have this EXACT model, but I'm sure it's similar. They love it! 6. Classic Legos. So we have a TON of Lego sets that James has worked on over the past two years, but Will's favorite is the set of random Legos that isn't themed. He enjoys making his own creations. No limitations! 8. Fliker Scooter. James rode one of these at a friend's house in September and then he asked for one for his birthday. This is really cool, but I cannot ride it to save my life! I cannot make it go!!! Eddie and the boys like it, though! 9. Osmo Genius Starter Kit. So this is another item that we don't have and haven't tried, but it has rave reviews from some friends. The ONLY reason my boys aren't getting this for Christmas is that we have the ORIGINAL iPad and it isn't compatible because it doesn't have a camera. If we had a new iPad, we'd definitely be getting this. It's awesome educational games that you can connect to your iPad to play. 10. Over-the-Door Basketball Goal. The boys got this about 3 years ago from my cousin and it has brought HOURS of entertainment in our playroom. It is INCREDIBLY well-made and the boys love to play. I will say that it's LOUD. It hasn't left any marks on the door, but it does bang and rattle when they play. 11. Ramona series. Will LOVES these books. Think it's because he can relate to Ramona's accidental-mischief-making? I had several of these as a kid and we've added onto that collection in the past few years. These are so cute. And honestly, ANYTHING Beverly Cleary is a favorite around here! Hope this helps if you're looking to shop for some little boys in your life!